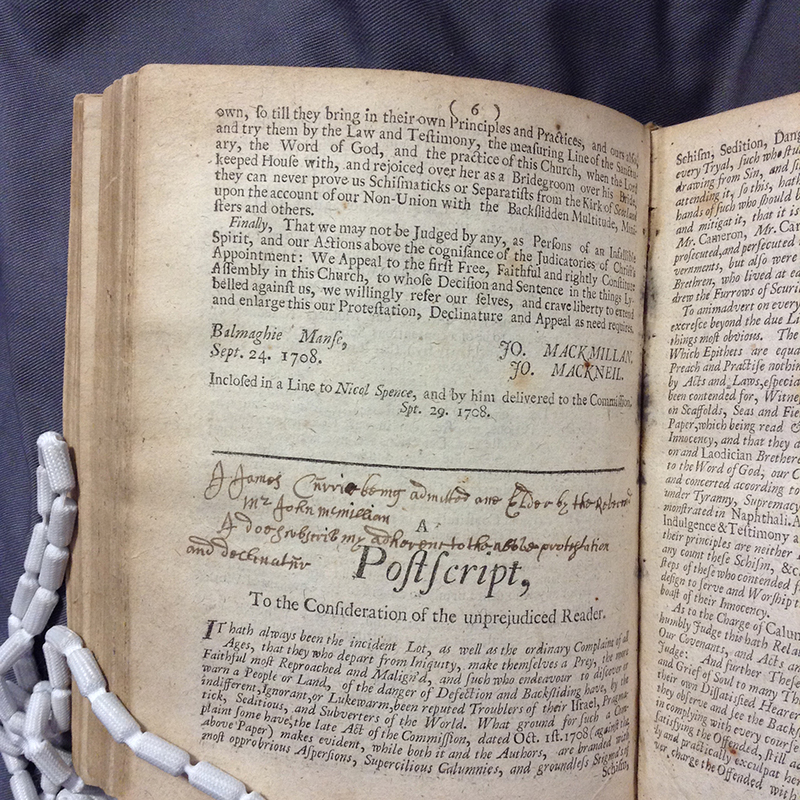 In the first of the reports from our 2018 Visiting Scholars, Laura Doak, a graduate student working at the University of Glasgow, shares with us her thoughts on James Currie’s “book of Colectiones” from the Hay Fleming Collection held in the University Library’s Special Collections. Several weeks on from my time in St Andrews as one of the Library’s Special Collections Visiting Scholars and there is still one source in particular playing on my mind. I had called up a print pamphlet from the catalogue and was both amazed and delighted when it arrived bound within a volume that also contained a substantial amount of un-catalogued handwritten letters, sermons, and much more. It was – to borrow a term from its own contents page – a “book of Colectiones”. 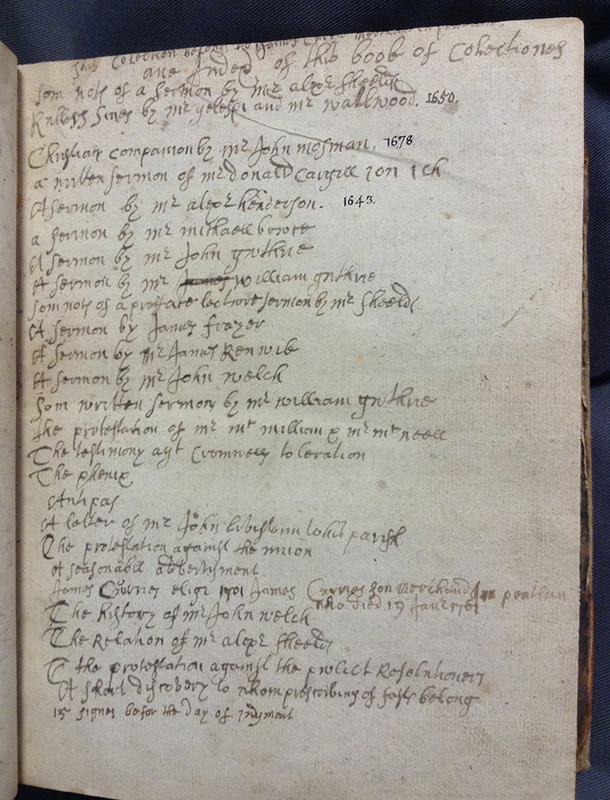 The volume’s (incomplete) table of contents, written in Currie’s hand. Handwritten notes upon a printed pamphlet. The volume was created by Pentland merchant James Currie (1656 – 1736). It extends to at least 780 pages although it is probable that others are now missing, along with its original front cover. Currie has signed several notes throughout the volume, meaning that much of the contemporary writing can be identified as his own. Some of the sermon and lecture notes appear in different handwriting, which may be that of his wife, Helen Alexander. Two of the printed items also bear the name “William Goold”. Both pre-date Currie’s death, including one that he has subsequently signed, so are not to be considered as later additions. Both are annotated in a third hand – most likely Goold’s own – suggesting ongoing discussion of Currie’s collected texts by multiple readers. The book immediately presents a dual significance. Firstly, it illustrates perfectly the complex web of intersections and interactions between ‘old’ channels of communication, like voice and manuscript, with the ‘new’, such as print, in the early modern era. To give but a few examples, the volume contains written notes on orally delivered sermons and lectures, signatures poignantly linked to print protestations, and handwritten ‘corrections’ to these later print editions that prove how printing itself did not represent ‘the final word’. And so the list continues. James Currie’s signature added to a printed copy of The Protestation, Declinateuer and Appeal of Mr John Mackmillan Minister of the Gospel at Blamaghie, and Mr John Mackneil Probationer and Preacher of the Gospel, sent to the Commission of the Kirk at Edinburgh the 29th of September 1708. Notably, Currie’s inscription notes that it was McMillian who had admitted him as a church elder. That it was James Currie who had compiled this volume also lends it a more specifically Scottish importance. Following the 1688 – 1690 revolution, Currie appears as a leading figure in efforts to erect the first Covenanters’ or ‘Martyrs Monument’ in Edinburgh’s Greyfriars’ Kirkyard. ‘Covenanter’ is the generalized term lent to Scots whose opposition to the Stuart monarchy derived from their adherence to the 1638 National Covenant and 1643 Solemn League and Covenant. Recent work on the Covenanters highlights their constitutional aims and this is something I have explored in my own research on Scottish political culture after 1660. In doing so, I have often had to deconstruct the potentially distortive lens of later covenanting or ‘Cameronian’ tradition. Texts of this nature, although named after the militant preacher Richard Cameron, almost entirely originate from after Cameron’s death in July 1680 and are written by Scots largely unknown and ideologically removed from Cameron himself. 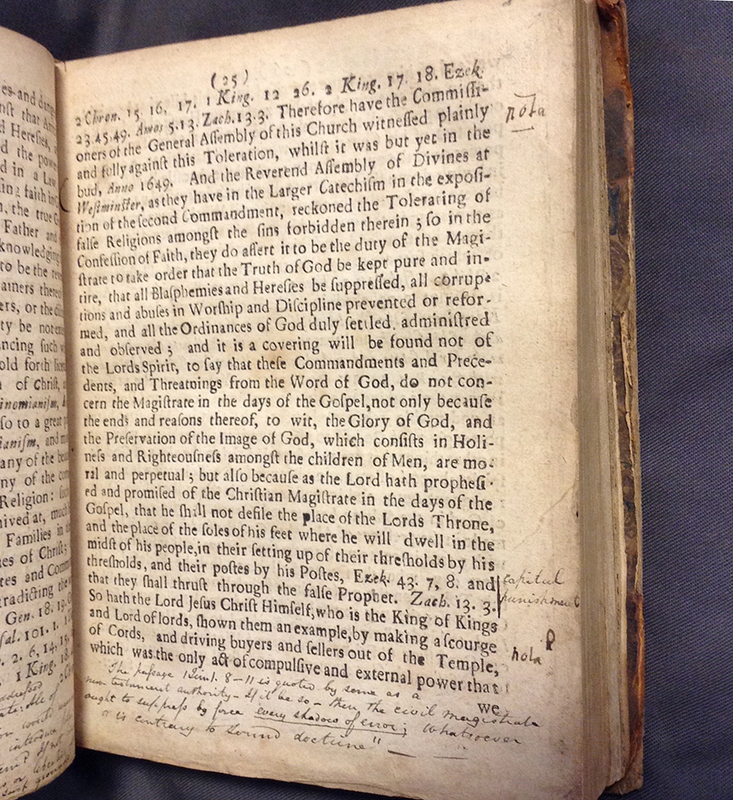 The volume contains a printed copy of Renwick’s Antipas, or the Dying Testimony of Mr James Renwick (1688). 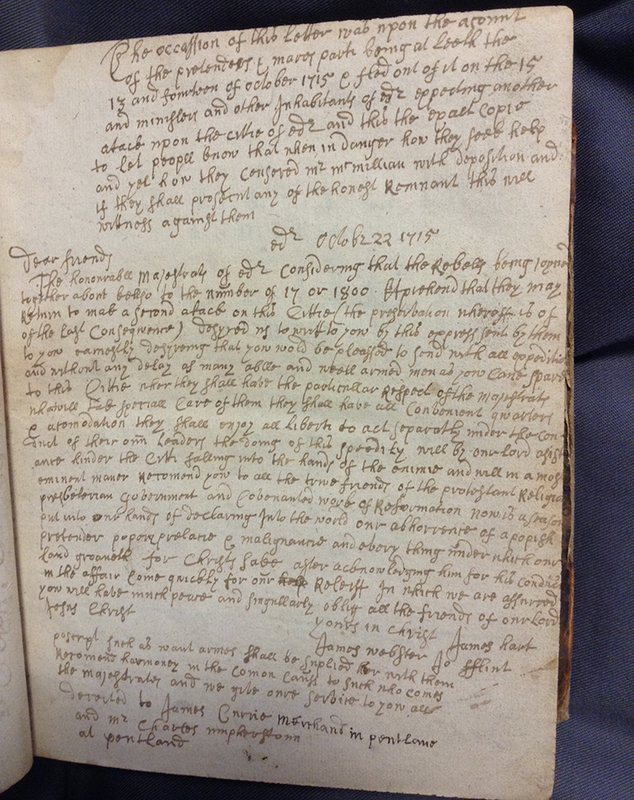 This appears to have been Currie’s personal copy and on the final page he notes that a manuscript copy of what was subsequently published had been confiscated from him and handed to the government before the fall of the Stuart administration during the 1688-1690 revolution. Currie appears to have been an exponent of this process as an exemplary – for lack of a better term – post-Cameron ‘Cameronian’. Although his autobiographical ‘testimony’ – which was later printed – claims that he attempted unsuccessfully to join the covenanters’ rebellion at Bothwell Bridge in 1679, he reveals that he did not wholeheartedly commit, or officially ‘subscribe’, to the militant covenanting cause until 1682 and, in following years became a close associate of James Renwick, a militant field preacher active in Scotland from around 1683. Indeed, Currie’s handwritten note upon his printed copy of Renwick’s final words at his execution in 1688 reveals his personal role in its original manuscript circulation. Yet although only a few years had passed, the ideas and actions of Renwick and his followers were formed in reaction to a swiftly evolving set of different circumstances in Scotland. They may have represented themselves as – and indeed believed themselves to be – the lineal descendants of earlier covenanters but, in reality, their ideological tenets became increasingly divergent and to use ‘Renwickian’ polemic and histories of the period as sources for the study of Cameron and Cargill themselves is potentially distortive. Currie was not an associate of Cameron or Cargill but chose to select and perpetuate some of their ideas. His collection includes notes on sermons and lectures delivered by both men. Similarly, Currie has collected texts written before he was even born: a 1650 sermon preached by Patrick Guthrie on ‘National Judgments’ serves as a prime example. But these documents also appear alongside documents relating to Currie’s own directly contemporary concerns, such as his printed copy of A Protestation and Testimony against the Incorporating Union with England (1706). 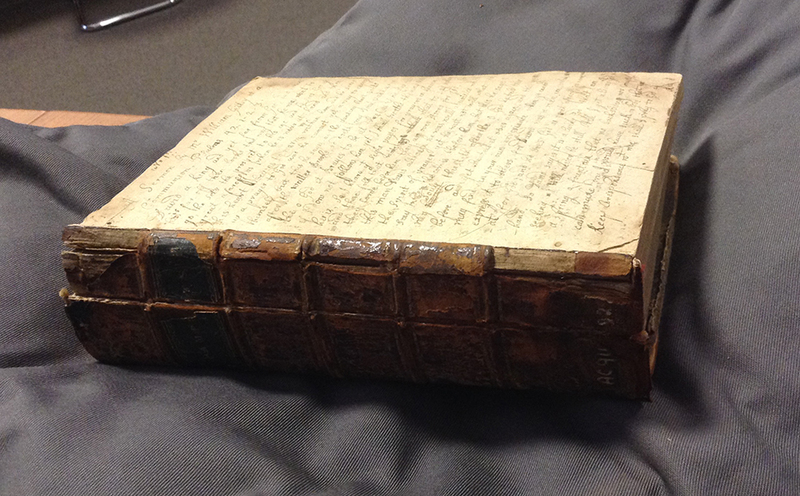 The volume also contains a handwritten copy of a letter he had personally received from Presbyterian ministers in Edinburgh requesting military assistance against the Jacobites in 1715. To Currie, and others like him, covenanting texts from earlier years – and even generations – were not items to be treasured for the sake of historical preservation but were part of an ongoing story and directly relatable to their own experiences. Currie’s “book of Colectiones”, therefore, presents itself as one that was very much ‘alive’ throughout its compilation: a volume containing and contributing to numerous dialogues with other texts in print, oral and manuscript forms. It was also in conversation with the past, incorporating covenanting texts from the 1650s, and the future, using pre-existing ideas to try and make sense of concerns over (a then only proposed) union with England. 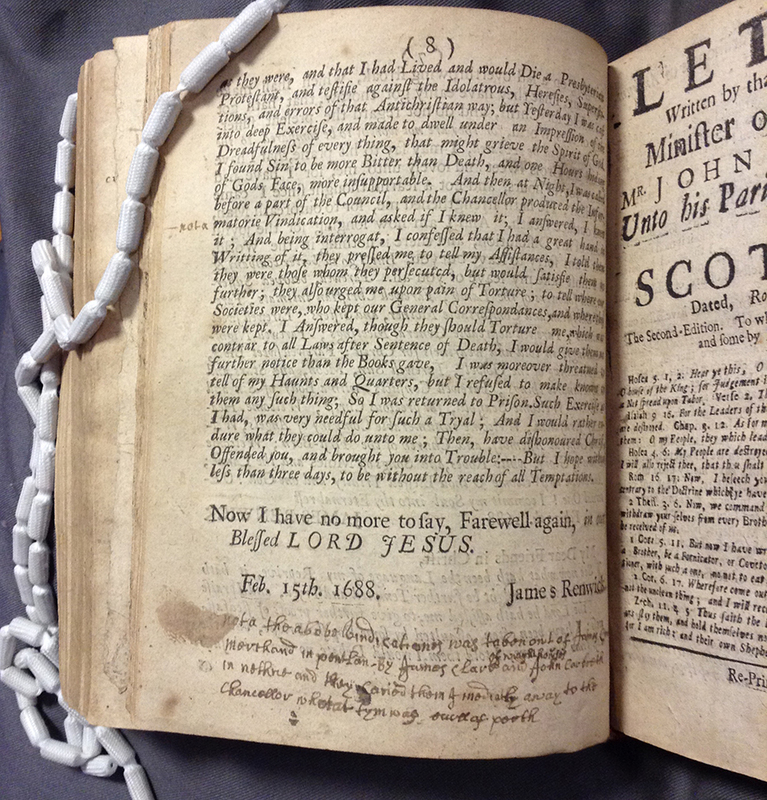 Many of the texts it collates deal with matters of public and national importance but it remains a personal collection, noting Currie’s unique interaction with Renwick’s final testimony and his own reaction to the 1715 Jacobite Rising. Currie lived through all of these events – and more – and his compilation of these texts, in their various forms, has above all reinforced to me how the process of writing history and, indeed, the process of collecting historical sources, cannot be considered purely from either a theoretical or historiographical point of view, but remains the product of lived lives and personal experience. I would like to take this opportunity to reiterate my gratitude to everyone at St Andrews University Special Collections who helped me during my visit. Thank you!